Descriptions like this make us pray for rain. A reader story. 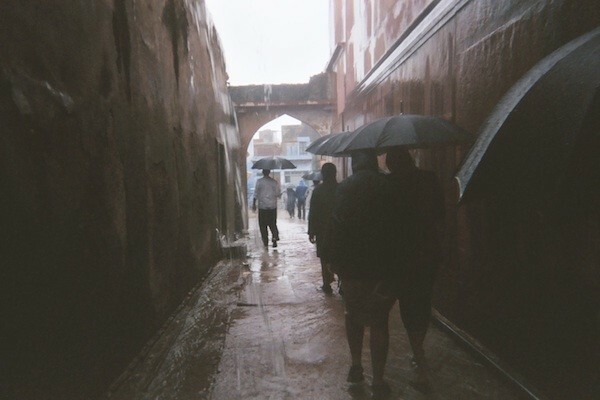 UTTAR PRADESH, India –There's nothing quite like a monsoon in a holy city. Narrow streets crowded with pilgrims and carts flood in mere minutes. An umbrella make a sad attempt to keep my head dry as murky water sloshes against my knees and unidentified things brush over my feet, which are protected only by flimsy sandals. A rickshaw rushes by, catching on my new salwar kameez bought only yesterday in a readymade shop. I try not to curse as I finger the rip in the turquoise fabric. Something else brushes against my feet — I pray that it's only litter, and not some street performer's escaped cobra. 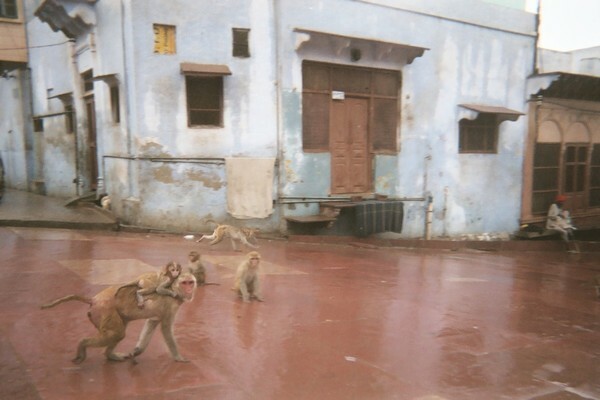 At least the rhesus monkeys that have been eyeing my sunglasses all morning have retreated under the building ledges. There they lurk, scowling pink faces peeking out from under the eaves. There are hundreds of temples in Vrindavan, the place where Krishna spent his childhood stealing butter, playing pranks, and fighting with demons in a forest that's all but disappeared. Banke Bihari seems hard to find, but it's Vrindavan's most famous temple, and even mispronouncing the name aloud will have locals pointing you in the right direction. Despite the wet, there's a line for the temple. It moves slowly, as pilgrims must remove their shoes before squirmming their way to the front of the space. Linked jasmine flowers hang from the ceiling. Up front, the faithful wait to see the god revealed. The merely curious (myself included) linger in the back. I stand on tiptoes, bouncing as high as I can for a better view. But the curtain is closed. That further explains the line at the entrance. After wading through the city, no one will leave without getting a glimpse of Biharji, an idol that represents the combined forms of Lord Krishna with his consort, Radhaji. I've only been sweating in the noisy temple for about five minutes when silence falls. A wall of fabric opens to reveal an ebony figure swathed in heavy pink and white fabric, and draped with gold jewelry and garlands of orange marigolds. 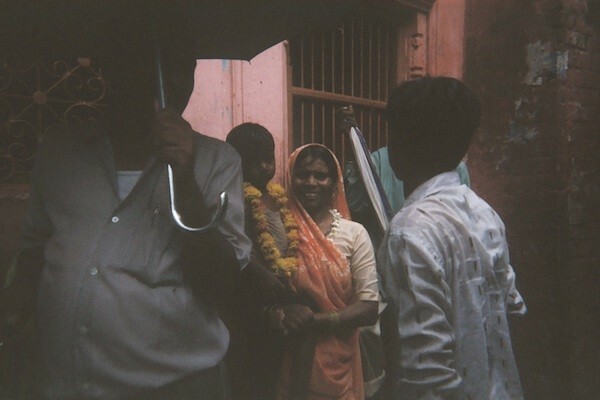 Here at Banke Bihari, darshan (the act of seeing or beholding) is different. 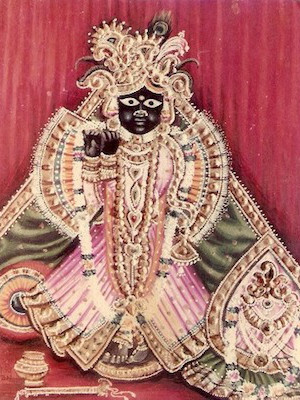 There are no bells — unlike so many other Hindu deities, Biharji doesn’t like them. His attendants hide him from view every ten minutes, drawing the curtains close to protect onlookers from passing out in the presence of his extraordinary beauty. Worshippers shriek, sing, and weep. A slight woman in front of me slides to the floor under Biraji's wide-eyed gaze. I'm starting to feel woozy myself when the heavy curtain slides shut and the chaotic reverie around me comes to a temporary halt. Before the idol is revealed a second time, I nudge my way back to my sandals, and slide them on. Outside, I close my eyes against the blinding daylight filtering through the clouds and imagine a beauty brighter than the sun. Images of a blue-skinned youth embracing a pale young girl appear, painted on the back of my eyelids. I blink and hail a rickshaw back to the hotel before the rain returns to wash it all away. Chris Ciolli is a Barcelona-based writer and translator. She's an unabashed bookworm and coffee addict. In her free time, Chris travels, paints, and plays with kitchen tools. She travels for the chill. Read about her travels at MidwesternerAbroad.com. Or follow her on Facebook, Twitter, Instagram or Pinterest.